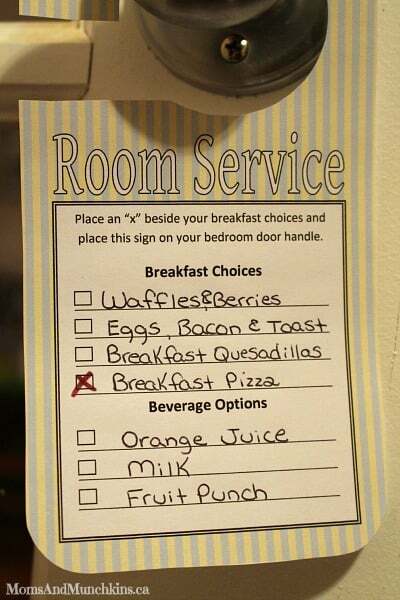 You don’t have to stay in a hotel to have some fun with room service! With this free room service template and this delicious sausage breakfast pizza recipe, you can plan a fun room service staycation right at home! Do you have any plans for this year’s Spring Break? We have lots of fun ideas for a staycation right in your own city. Stay tuned for links to these ideas at the end of this post. 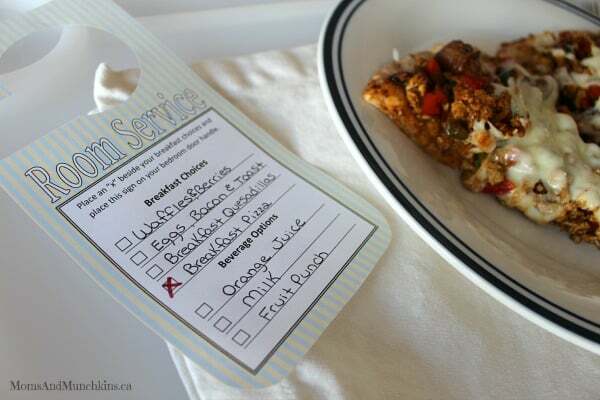 With this free room service template, you can write down some options for your little guests to choose from. This would be fun for a staycation at home, a special birthday breakfast, a weekend treat or any other special day of the year! Your kids can put an “x” beside their choices and leave the completed notice on the door handle outside their bedroom door. When they wake up in the morning they can be greeting with their breakfast choices on a breakfast in bed tray. A fun idea would be to serve them all in one room while sitting together in bed. 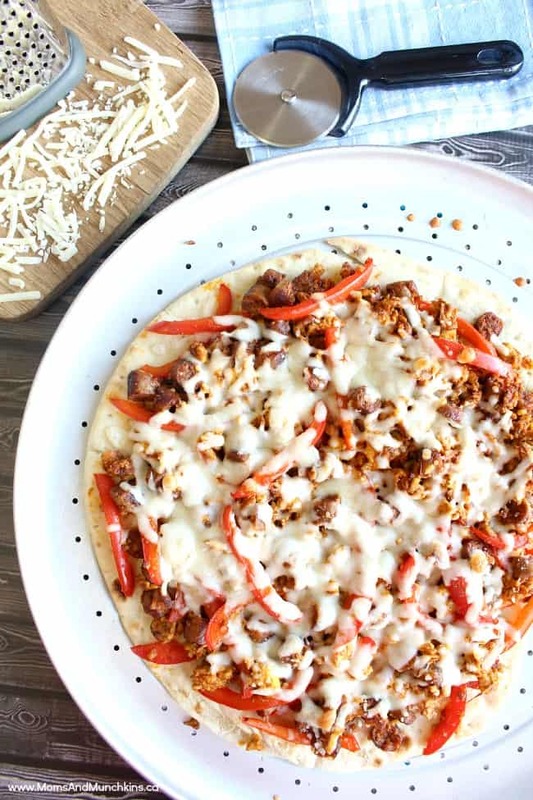 When reading this recipe you may think to yourself “taco seasoning on a pizza” but trust me – it’s delicious! I used a mild taco seasoning and found that it was the perfect level of spicy for breakfast. This delicious breakfast pizza is also great for supper! In a frying pan, cook the breakfast sausages thoroughly. Slice the cooked sausages into bite sized pieces. Scramble the eggs in a frying pan. Once scrambled, add the sausages, bell pepper, the taco seasoning and 1 cup of water (follow the directions on the back of the taco seasoning package to determine how much water to add, most say 1 cup). Cook over medium-low heat until most of the liquid has been absorbed. Put the egg & sausage mixture on the prepared pizza crust and sprinkle the cheese on top. Place pizza in the oven and bake until the cheese is melted and starts to bubble. Camping Kit (this has a Christmas theme but it’s fun any time of the year! Love the idea of the Room Service card. I should do that next time my parents come to visit for the week-end!